A long long time ago there lived an outlaw called Robin Hood. Robin Hood stole some money from the wealthy when he had got the money he would give the poor people some money. Did you know that the outlaws made their own home. Robin Hood was the best archer in the world. From about 100 paces away Robin Hood could shoot his arrows to the sheriff's deer. The sheriff had an idea he was going to hold an archer competition. The sheriff's idea was when Robin Hood comes to the competition all the guards will capture Robin Hood and his friends and send him to prison. The competition is just around the corner if any archer wins the prize for 1st place will be a silver trophy. The day of the competition had come Robin Hood just going there with his dirty clothes he had to go in disguise. When Robin Hood went to the competition in disguise nobody could recognise him. Each archer had their turn Robin Hood was the last archer. After 1 shot Robin Hood was about to receive the silver trophy just 1 more shot then he will get the silver trophy. 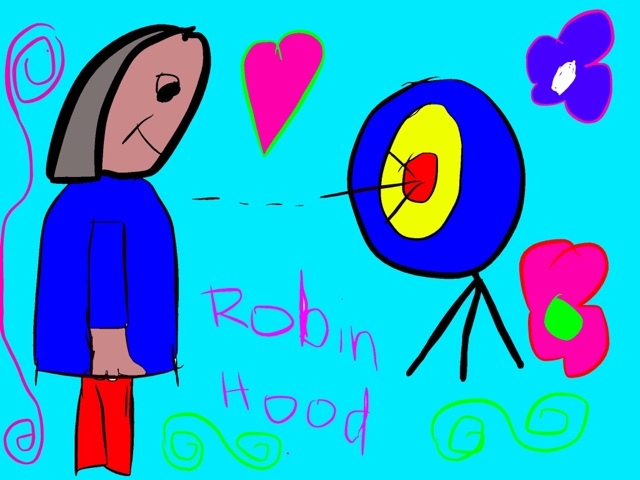 Then it was quiet Robin Hood took his aim then he got both arrows on the red target. The crowd went viral then Robin Hood rushed home and hid the silver trophy and they lived happily ever after. The End.